The next great wave of wealth transfer in the United States has already begun. 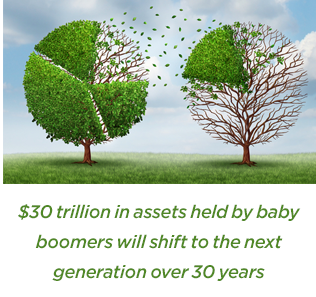 More than $30 trillion in assets held by the baby boomer generation will shift to the next generation over the next 30 years, according to research firm Cerulli Associates. As assets move to the next generation of heirs, advisors may capture and retain this business if they position themselves with a broad offering of expertise. Boomers hold more than ha lf of the nation’s total mutual fund assets. In addition, high-net-worth clients work with an average of more than four financial services providers. There is a significant opportunity for advisors who make connections with the family and future heirs of clients. In addition, advisors need to address non-investment issues such as wealth transfer and family dynamics with clients. Connecting with the next generation may seem to offer a lower value due to time constraints and working with adult children with smaller accounts. But these may be issues only in the near term. To connect with the next generation more efficiently, advisors may consider embracing technology, which is typically more critical to the next generation and may mitigate any geographic barriers to the relationship.